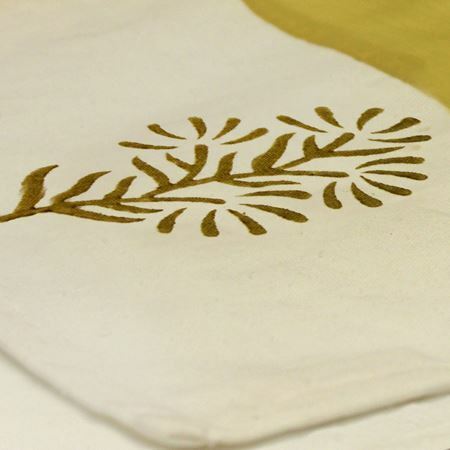 Block printing is an ancient craft, the origins of which are believed to date back to the 3rd century in China. The first known practice of this craft in India dates back to the 12th century. It is believed to have spread to other parts of India from Gujarat and Andhra Pradesh, where it first took root having been introduced by Chinese travellers. Its popularity saw regions like Sanganer in Rajasthan emerge as prominent centres of block printing in the 18th century. The craft of block printing by hand or Block Mudrana (in Hindi) is practised by artisans across India. However, the forms and styles of printing vary largely from region to region with Machilipatnam, Rajkot, Bagh emerging as the main centers of the craft. Artisans print by hand using blocks of wood that have been etched with needles to create intricate patterns.